It's Fall! As I say this, it's 98 degrees outside, but it's Fall nonetheless. Us desert dwellers have to ignore the weather and put out our Fall decor anyway. I wish we could ignore the weather and put on sweaters! I'm dying to put away my flip flops and shorts and don closed toe shoes, skinny jeans and a comfy knit sweater. 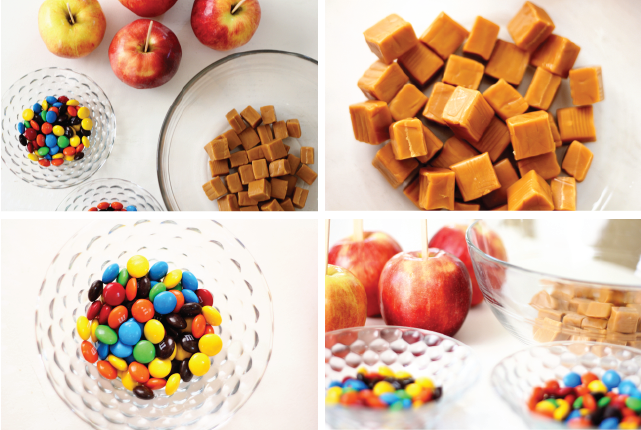 For a few days last week we had some cooler weather and to celebrate we made carmel apples. Mmmmm. We were a little scarce on the carmel because someone, I'm not naming names, forgot how much she LOVES caramels and snuck half the bag. This is why 99.9% of the time there is no junk food to be found in my home. I have zero self-control with the goodies. What are you doing to celebrate this wonderful season? Oh man...I love me some fall treats (or any season treats, really). I've finished off two pans of pumpkin sheet cake already this year. I am doing great, just busy. You are so sweet to respond to all your comments individually...you're awesome! Yum... we did ours the first day of October, we may have to do them again. I can't get the caramel to stick so well to the apples so we just cut it up in chunks and dip them and eat them like we did when we were kids. Yum!!! I am loving your photos too, beautiful!! I am in the mood now for a caramel apple! I've baked some pumpkin spice cookies with a nutmeg icing. I love Fall and all that it brings....sweaters, jeans and boots, lots of baking, homemade soups and lots of family gatherings. oooohhh goodnesss! Those look so delish! I love candied apples I just don't want to make them lol!